Delicious early and late season heirloom favorite. Introduced to the seed trade around 1910, this variety was brought to our shores-and our gardens-by Italian immigrants. A deliciously old-fashioned broccoli, it boasts dark bluish-green central heads about 5" across. Tall, erect, 30-36" plants give way to multiple side shoots once the central head is cut. Harvest 60-90 days after transplant. We searched the world to find the best organic seed-Burpee fully guarantees that not a drop of synthetic chemicals was used to produce these excellent seeds. Certified Organic Seed. 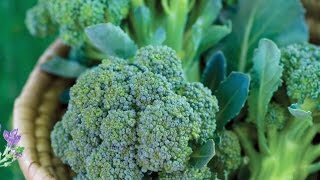 Growing broccoli and cauliflower in containers is easy in early spring and again in the fall. The flavor of garden-fresh broccoli is beyond compare to anything you find in the supermarket. This cool-season favorite is best grown in spring and fall. Broccoli may be direct sown or started indoors early for fall and spring crops, or purchased as transplants for a fall crop. Start seeds indoors about 8 weeks before outdoor planting. Sow in average soil in a sunny location in early spring or in midsummer for a fall crop. In rows 2 feet apart, sow seeds thinly and cover with ¼ inch of fine soil. Keep evenly moist. Water gently. Thin to stand about 16 inches apart when seedlings are 1-2 inches high. Dig a hole for each plant large enough to amply accommodate the root ball. Space plants 1-2 feet apart in rows 2 feet apart. While small, floating row covers will help to keep pests at bay. Pick broccoli when the heads have tight, firm buds. This happens about 50-60 days after transplant. Cut off central head along with 6 inches of stem so broccoli plants will produce smaller heads, which can also then be harvested. 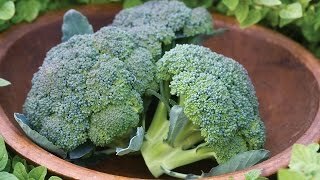 Broccoli may be frozen for future use. Cut florets and blanch them. To do this, drop into boiling water for 2 minutes, then plunge into cold water to stop the cooking, drain and store in freezer bags or vacuum bags. Eat the heads raw or cooked.